Figure 1. Crew on the road. Atlantic Response® came to being as a response to the growing demands in the Middle East and the international market for state-of-the-art satellite uplink systems and full-fledged production facilities and services. Atlantic Response® is fast becoming one of the leading suppliers for the rental of fully automated mobile satellite uplink systems. 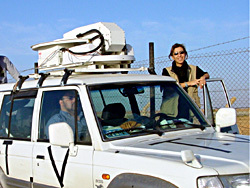 We provide systems in the field and customers ranging from Al Jazeera to ABC News. Atlantic Response® products complete vehicles in various configurations for OB, News, IP casting, emergency circuit restoration as well as military application, with availability of upgrade packages for existing systems. Atlantic Response's 24 hours service department may offer service-restoring option with 12 hours response time in many areas of the world. Atlantic Response® provides complete filming sets for hire (including cameras, lenses, filters, tripods, matt boxes, lighting and sound equipment) as well as crews if needed. We also provide editing facilities and experienced staff to provide you with the best possible end results. Using our state-of the-art satellite uplink systems we can transmit to almost anywhere in the world, 24 hours a day, 7 days a week. Our highly qualified and experienced technicians are always on site to ensure quality transmission. Atlantic Response® offers studios, both indoor and outdoor rooftop, for single camera setups with live feeds for news reporters, to complex productions using four cameras in a digital production studio. 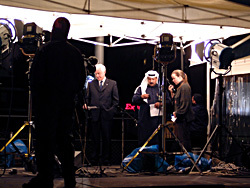 We are able to cater for everything from news interviews to talk shows, entertainment and sports. Our single camera studios come fully equipped with a variety of backdrops and chroma facilities. We have highly trained and experienced staff, who are capable of catering to all deadlines. Atlantic Response® handles both the pre-production planning which includes detailed information such as studio specifications, location plans, live broadcasting equipment, equipment lists, staff availability and training, technical requirements. We also provide logistics services from airport pickup to security clearances, filming authorizations, local connections, interpreters and equipment hire. We make your business our business. Soon to open offices in the UAE, Qatar, London, Paris and Washington DC.